I believe we are hunting a gorgon, an ancient cursed being, with an affinity for snakes and a hunger for human flesh. A gorgon is a type of demigod that feeds on humans and can see the fate of others through the consumption of human eyes. A famous gorgon is Medusa, who was hunted in ancient times by the hero Perseus. However, the legends about Medusa and the gorgons became greatly exaggerated over the centuries, with a gorgon's paralyzing venom being turned into tales of gorgons transforming people into stone. 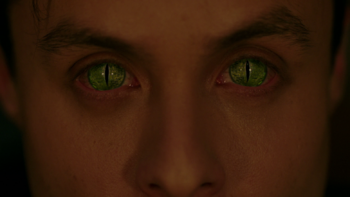 Gorgons appear human, but upon consuming human eyeballs their eyes will change to that of a reptile and allow them to get a glimpse into the future. According to lore, every few months gorgons will go on a spree and gorge themselves, not unlike snakes. Rowena calls them cursed beings, but it is unclear what this means exactly. Animal communication - A gorgon has the ability to communicate with and understand snakes. Paralyzing venom - With a simple kiss anywhere on an individual, including angels, a gorgon is capable of paralyzing their prey. The numbing effect of the venom takes time, however, and a gorgon may start feeding before the venom has taken effect, causing their victims to feel everything. Precognition - By eating the eyes of a human, a gorgon gains foresight -- the ability to see their enemies coming before they arrive and to see the fates of those they look upon. However, their foresight is limited to humans and they cannot see angels even when they are standing right next to a human featured in one of their visions. Super strength - A gorgon is strong enough to fight evenly with and defeat angels. Silver blade - A gorgon can only be killed by having their head chopped off with a silver blade. Luther Shrike shows Sam a fossilized gorgon tooth, believing that it's a fang of the Basilisk. Although Sam corrects him, he admits that it's still cool. While Sam and Shrike are fighting, Luther gets the upper hand by using the gorgon tooth to knock Sam out cold. The Winchesters, Castiel, and Jack Kline hunt a monster who leaves behind six victims and always evades their efforts to catch him, even after they call in Rowena for magical help. Rowena helps them determine that the monster they are after, Noah Ophis, is actually a gorgon. After a taunting note from Noah to Dean shows that his foresight fails to see Castiel, the Winchesters plan to send Castiel and Jack after Noah, who can't see them coming. To help, Rowena concocts an antidote to gorgon venom for them and uses a tracking spell to find Noah. Armed with silver blades, Castiel and Jack confront Noah and rescue his latest victim, but he proves to be too strong for the angel and the powerless Nephilim, using his poison on Castiel. When the Winchesters intervene, Noah knocks Dean unconscious and attempts to escape, but is decapitated by Jack, who takes Noah's pet snake Felix as his own pet and saves Castiel from Noah's poison. However, Dean being knocked out by Noah allows Michael to escape his prison within Dean's mind. In Greek mythology a gorgon was a creature whose gaze could turn a person to stone. The most well known are the three sisters - Medusa, Stheno, and Euryale - who had live snakes for hair, and who would turn any person who looked on them to stone. In one variation of the myth of Medusa by the Roman poet Ovid, she was cursed by the goddess Athena and transformed into a monster for laying with Poseidon in Athena's temple. This page was last edited on 12 March 2019, at 01:31.